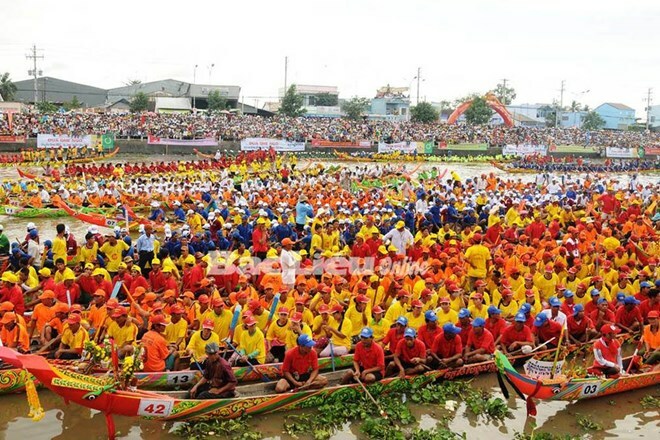 The ethnic Khmer people in the Mekong Delta will celebrate Ooc-om-bok Festival, one of their most important traditional festivals, on November 25-26. The festival, known as the Moon Worshipping Ceremony, takes place on the evening of the 14th of the 10th lunar month. It begins around 7-8pm when the moon's position is high in the sky. People celebrate at home outdoors or at ceremonies at Khmer pagodas. They pray for good luck, happiness, good weather and bumper crops. On the second day, the long boat race is held. A boat is about 24m long, 1.2m wide and is able to hold about 40 people. Each team represents a pagoda, village or community.